This is the only small screen colour television B&O have ever offered. At a glance it appears to be a miniaturised version of the full sized MX models, but closer inspection shows that it is in fact a special version of the Philips CP90, built in Italy. Text copyright © Beocentral. Unauthorised reproduction prohibited. This was the only television in the B&O range for a long time not to be fitted with a 110 degree tube, the deflection angle in this case being 90 degrees, so the set is surprisingly deep. A larger than normal loudspeaker with foam damping raises the sound quality, though unlike all other MX televisions, it is only mono. A re-programmed microprocessor means that remote operation is possible via the Beolink 1000 Terminal, and Datalink is available through the Scart socket. Another curious addition is that pressing the power on button slightly causes the tuner to enter search mode, though stations cannot be stored without the Beolink 1000. Text copyright © Beocentral. Unauthorised reproduction prohibited. 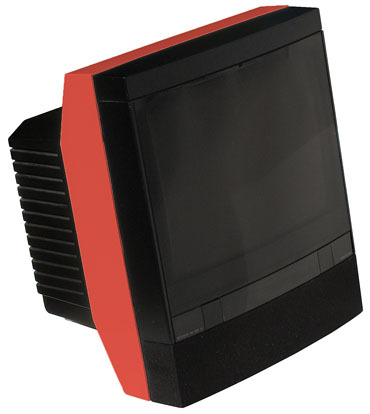 The cabinet shell was available in the same choice of colours as the rest of the MX range and Beocord VHS 82.2 video recorder, which also being of Philips origin, matched it very well. Text copyright © Beocentral. Unauthorised reproduction prohibited.